Pygmy Killer Whales are small members of the Dolphin Family. 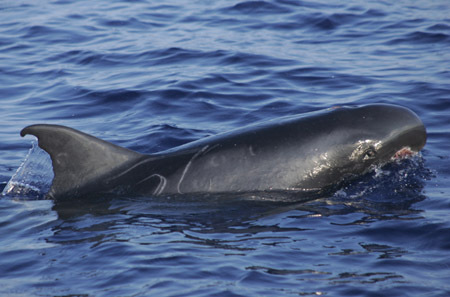 It is also known as the “Slender Blackfish” or “Slender Pilot Whale”. Till the 1950’s the Pygmy Killer Whale was only known by the skulls that were preserved at the British Museum. It is one of the least frequently encountered species of oceanic dolphins in the world. They are the World’s rarest Cetaceans, hard to find and hard to study. The Pygmy Killer Whales are generally average sized Dolphins. Color: Their body is black in color. There are white patches on the mouth, chin, chest and abdomen. The sides are light grey in color. The back may be brownish grey or black. The beak and the genital area are usually white. The lips and often the entire jaw are white, which resembles a “goatee”. A dark stripe stretching from top of the head and the widening at the dorsal region forms the dorsal cape. A light grey patch extends from the throat to the vent area. There is a pale grey area on each flank and white patch on the ventral side between the flippers and the tail. The cape is also dark. Size: The Adult ranges in length from 2.1 to 2.6. The dorsal fin is about 220mm high. The base is 375mm long. The teeth are about 8mm in diameter at alveolus, less than 30 mm in length. They have 16-24 teeth on top row and 20-26 on bottom row. Weight: Their weight ranges around 110-170 kg. The maximum known weight is 225 kg. 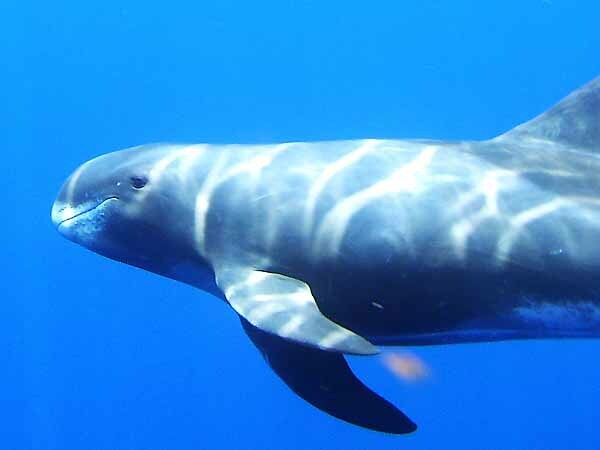 Shape: The Pygmy Killer Whales closely resembles the False Killer Whales and Melon Headed Whales. The head is round and the body is slender and small. The Flipper tips are round and the dorsal fin is large. The jaw is under slung and the beak cannot be differentiated from the head. The backbone contains 68-71 vertebrae. The long flippers are round at the tips with convex leading and convex trailing edges. They have a robust body that narrows towards the dorsal fin. They have blunt nose. The Flukes are pointed and slightly notch in the middle. Pygmy Killer Whales are known to be found in the tropics of the Pacific, Atlantic and the Indian Oceans. They are frequently seen in Hawaii and Japan. They are also found in the Gulf of Mexico, Mediterranean Sea, The Indian Ocean, South Eastern Atlantic Ocean, and also near Sri Lanka. It is not abundant anywhere. Pygmy Killer Whales do not approach close to shore areas except where there is clear water. They love to stay near deep, warm waters. They are found in Tropical and Sub Tropical Waters worldwide. Pygmy Killer Whale has certain behavioral traits. Pygmy Killer Whale is always seen in groups of 15-30, sometimes even more. They are not generally acrobatic but they have been found to be spy hopping, tail slapping and breaching. These dolphins are seen logging, especially if it is sunny. These species of Whales are lively swimmers. They are found to strand often. These mammals are very aggressive. They are believed to be non-migratory. These species of killer whales have sounds similar to whistles and clicks of bottlenose dolphins. They feed on squid, octopus, small fish and occasionally mammals. They attack and eat large fish also like tuna and other Dolphins. The Pygmy Killer Whale has certain adaptive features. They have acute vision in and out of water. Their increased size and thick insulating layer helps them to maintain their body temperature. Their large teeth help them to feed on large prey. Their large size and aggressiveness makes them impenetrable to many predators. But large sharks or Orca may eat them. Not much is known of their breeding habits. The males and females become sexually mature when they reach the length of 7 feet. The calves are 32 inches long at birth. They are believed to breed in the summer months. Usually one calf is born to each female. Pygmy Killer Whales live for a maximum age of 14 years. There is not much information available in the IUCN. They are widespread but not very common. Their primary threats are fisheries and high sounds. Though not much research has been done whether they are declining in numbers or not. 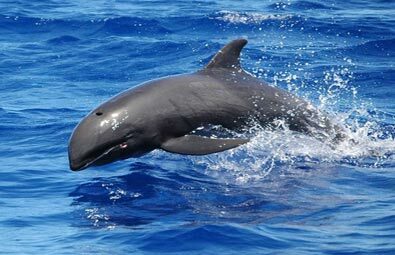 Some of the key interesting facts of Pygmy Killer Whale are given below. The Killer Whale is often confused with the False Killer Whale and also the Melon Headed Whale, because of its body shape. The Killer Whale can extend its eyes from sockets to look behind itself. 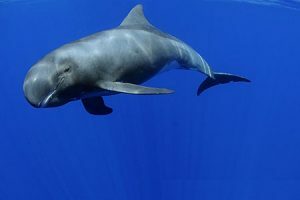 Here are some of the amazing pictures of Pygmy Killer Whale. This is both street smart and ingtelilent.